Dark Roast. This 20-acre micro-lot farm is owned by Francisco Hernandez-Gil, known as “Chico” Hill, and his family, located near the municipality of Mercedes Ocotepeque/San Marcos, Ocotepeque, Honduras. This micro-lot farm produces some of the best coffee in Honduras. Light Roast. This washed coffee was produced by the Sidama Coffee Farmers Cooperative Union as they represent coffee producing Coops in the Sidama zone throughout Southern Ethiopia. Medium Roast. Using the best green coffee beans from Brazil and Honduras, we have created a blend for sweetness, balance, and to compliment food pairings. Great for morning or evening enjoyment! Decaf Roast. Rookie is Swiss Water Decaf Processed organic decaf coffee. The Swiss Water processing is a natural process that provides terrific organically processed beans. The Honduras and Brazil coffee beans used in this perfect blend along with the lighter roasting method create an amazingly strong, delicious cup of coffee -without all the caffeine. Medium Roast. 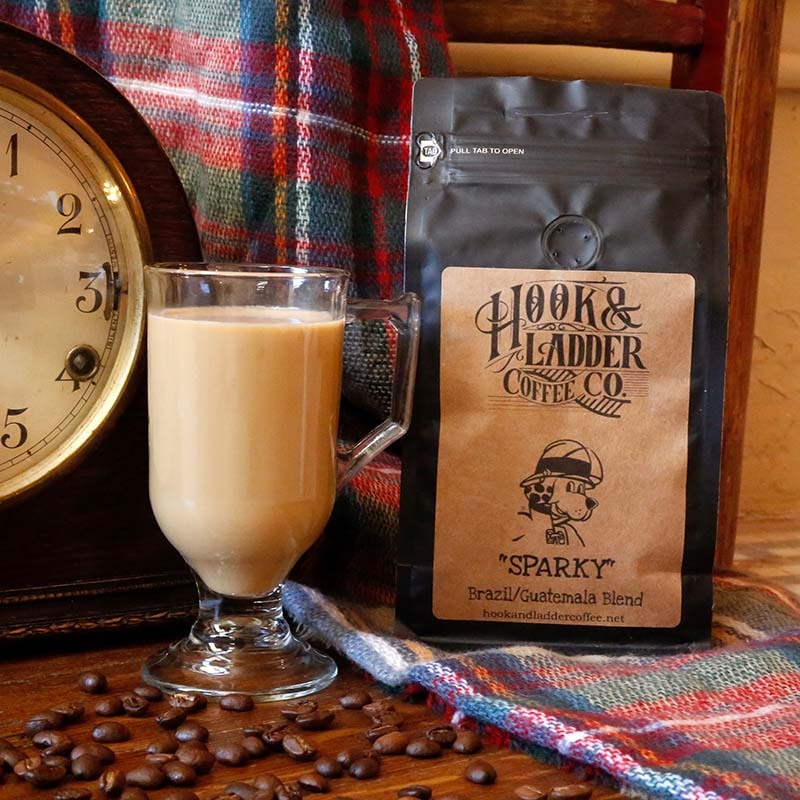 “Sparky” Coffee is named after the Fire Dog housed at Station 4. He served faithfully and was a great companion and friend to all he met. This coffee is Sparky’s way of paying tribute to our local fire department and the saving of lives of local dogs and cats. Your purchase supports the P.E.T.S. Clinic. P.E.T.S. offers services and programs to dogs and cats that save and improve their lives. Light Roast. 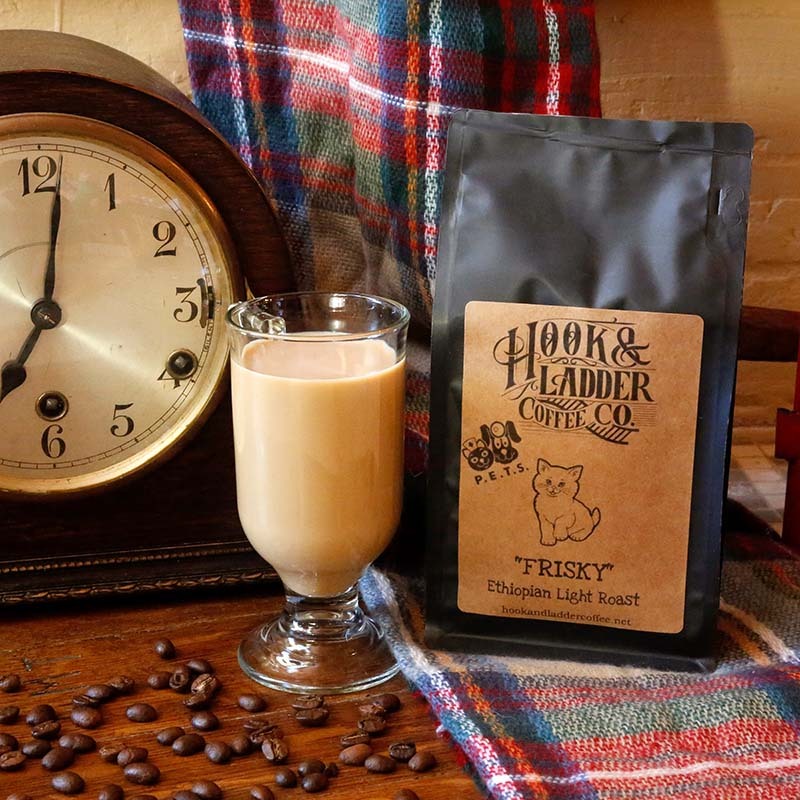 “Frisky” is a light roast single origin Ethiopian. It perfectly captures that wonderfully whimsical mood that lightens your spirit and brightens your day. Your purchase supports the P.E.T.S. Clinic. P.E.T.S. offers services and programs to dogs and cats that save and improve their lives. Medium Roast. As a special single origin Honduras coffee bean know for its uniqueness, our coffee beans from La Campa Lempira, known as “Nozzleman,” are one of our most popular coffees and best sellers. A Estrella Lenca is harvested in the region surrounding La Campa Lempira. The Lencas are an indigenous people descended from Lempira, also the name of the Honduras national currency. Medium Roast. “Puente Tarrazu” is a micromill located in Costa Rica’s Tarrazu valley. Rudolpho Rivera and his family own and operate this privately run mill, processing coffee from the farms of five neighboring families. This particular lot is Rudolpho’s coffee from his farm “La Pena,” which is planted entirely in Caturra cultivar. Medium Roast. Its name comes from its distinct aroma due to its blend of two regions Cafes de Oriente, and Huehuetenango. Huehuetenango gives it a high acidity and a wine quality, and Cafes de Oriente gives sweetness and body. Medium Roast. Santa Ines is a smaller lot coffee from the Sertao family of farms that produces our single origin Brazilian coffee beans. The farm is owned by Francisco Isidro Dias Pereira, and is 75 hectares dedicated to coffee with a total size of 215 hectares. Santa Ines is located in Carmo de Minas. The “All Hands” Espresso Blend is a “secret” combination of the best green coffee beans. These include Guatemala beans, Brazil beans, and Honduras beans. The exact portion of each single origin bean is added to each roast mix. Once roasted, the “All Hands” Espresso Blend brews up the perfect cup of espresso.